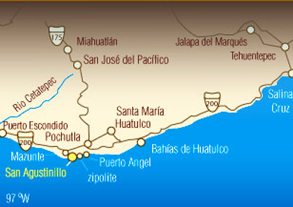 San Agustinillo is best reached by flying to Huatulco (40km away) or Puerto Escondido (60 km away). Flights from Canada or the USA are usually routed through Mexico City or Houston, Texas. Three domestic carriers run daily flights from Mexico City to Huatulco. Once at Huatulco you have 2 options for a taxi. The airport taxi is more expensive than taking a local taxi. These are easily available is you walk out of the airport (300 meters) to the main road. The picturesque ride to San Agustinillo is around 45 mins. Air Transat now has direct flights into Huatulco from VANCOUVER and western Canadian cities. However they only run limited months of the year.